Junction box cover plate. 4 inch. Universal non shunted bi-pin T8/T12 tombstone and U-shape tombstone replacement sockets. For use with ETI linkable LED fixtures. Long life fluorescent starter with condenser. Long life fluorescent starter with condenser. Commercial grade white fluorescent lampholder. For use with fluorescent lighting fixtures in flush or surface mount applications. Maximum 660 watts, 600 volts. Metal bracket used to retrofit 8' Fluorescent strip lights to energy efficient LEDs. Converts both T12 and T8 fixtures. For use with 3 or 4 F17T8, F25T8, F32T8 or F32T8/ES bulbs. Minimum start temperature 0 degrees (Except for F32T8/ES 60 degrees). 120-277 volt. UL and CSA listed. For use with one or two F30T12, F34T12 or F40T12 bulbs. Minimum start temperature 50 degrees. 120-277 volt. UL and CSA Listed. For use with one FC12T9 or FC16T9 Circline bulb. Minimum start temperature 50 degrees. 120 volt. UL and CSA listed. For use with one FC8T9 and one FC12T9 Circline bulbs. Minimum start temperature 50 degrees. 120 volt. UL and CSA listed. For use with one or two F72T12, F96T12 or F96T12/ES bulbs. Minimum start temperature 0 degrees (except F96T12/ES- 60 degrees). 120-277 volt. UL and CSA listed. White slimline lampholders. For replacement use in fluorescent lighting fixtures as well as enclosed outdoor signs. Molded of white thermoset plastic for appearance and durability. UL Listed. Temperature rating of -40 to 65 degrees C. Commercial grade white fluorescent lampholder. For use with fluorescent lighting fixtures in flush or surface mount applications. Maximum 660 watts, 600 volts. Provides general illumination for indoor and damp applications. Product features include snap assembly of ends, socket bars and wire way cover. Heavy-duty channel is die formed from 22-gauge steel. Channel cover snaps to housing for access to wire way. Electrical connections are made inside the wire way. Standard mounting holes and wiring knockouts are included. Fixture can be mounted individually or in continuous rows for surface or suspended mounting. Applications include light commercial, industrial, retail, coves and displays. Fluorescent lamps are exposed, no diffuser. Finished in lighting grade white baked gloss enamel paint. Use with T8 fluorescent linear lamps, not included. cULus listed for damp locations. White slimline lampholders. For replacement use in fluorescent lighting fixtures as well as enclosed outdoor signs. Molded of white thermoset plastic for appearance and durability. UL Listed. Temperature rating of -40 to 65 degrees C. Unit comes fully assembled. 20 gauge 5-3/8" diamond plate reflector. Suspended mounting only with included 12" chain. Minimum spacing from ceiling surface is three inches. 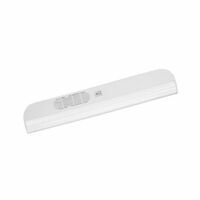 Uses 32W linear T8 fluorescent lamps (not included). Quiet running premium electronic ballast. 0 degree cold start-up. Downward facing pull chain for on/off function. 5 foot cord and 3 prong plug included. For use on non-dimmable switches only. All mounting hardware included. cUL, ENERGY STAR. For use with one or two F72T8 or F96T8 bulbs. Minimum start temperature 32 degrees (Except F96T8 E/S 60 degrees). 120-277 volt. UL and CSA listed. Good Earth Fluorescent Undercabinet Light, Corded, Slimline, Plug-In, Good Earth, 14 W, 120 V, T-5 Bulb, Tubular Shape, White, Electronic Ballast, 1-1/8 in Diameter, 22-3/4 in Length, 2.7 in Height, Includes: On/Off Switch, 5 ft Cord, (1) F14T5 Linear Bulb, cULus Listed, Clear Acrylic Diffuser, For Indoor Use in Kitchens, Cabinets, Bookcases Designed to be used anywhere a traditional fluorescent fixture is used. UV, IR and Mercury-free. Linkable LED shop light, 4000K. Rated 50,000 hours. Energy Star. UL/cUL Listed for damp locations. White slimline lampholders. For replacement use in fluorescent lighting fixtures as well as enclosed outdoor signs. Molded of white thermoset plastic for appearance and durability. UL Listed. Temperature rating of -40 to 65 degrees C.
Linkable 2' shoplight comes with a 5' power cord, 5' linking cable, end to end connector and chain packet to suspend. For workshops, hobby rooms, basements, sheds, garages and more. 18 watts, 120 volt, 1600 lumens, 4000K. Instant start down to -4 degreesF. 50,000 hours rated life. Energy Star and cUL Certified. For use with one or two high output bulbs - F48T12/HO, F60T12/HO, F72T12/HO or F96T12/HO. Minimum start temperature -20 degrees (except F96T12/HO E/S 60 degrees). 120-277 volt. UL and CSA Listed. Rugged steel chassis with baked white enamel finishing. Flush, stem or row mounting. Can be hung individually or in continuous runs. 20 degree Fahrenheit starting temperature. 4-1/4" width x 3" depth. Lamps not included. Used where traditionally a fluorescent fixture would be used such as garages, sheds, out buildings, utility rooms, workshops and closets. 120-277 volt, 4000K bright white light. Instant start down to -4 degrees F. 50,000 rated life. Energy Star and cUL Certified. Low profile, narrow wrap light fixture, 2 light, 32 watt. White steel housing and clear prismatic diffuser with white metal ends. Diffuser hinges from either side for easy mounting. Uses 2 each F32 T8 lamps (not included). Energy star qualified, meets new energy legislation requirements. 48-1/4" x 7-9/16" x 3". Designed to be used anywhere a traditional fluorescent fixture is used. UV, IR and Mercury-free. Linkable LED shop light, 4000K. Rated 50,000 hours. Energy Star. UL/cUL Listed for damp locations. Replaces most applications using 2-light T8 fluorescent lamps. 4000K. UL/cUL Damp Locations, UV, IR and Mercury-free. Energy Star Certified. Molded of durable white thermoset plastic. Can be used for flush or surface mounting. Push wire cap, screw switch. Maximum 660 watts, 600 volts. UL Listed. Fixture can be mounted individually or in continuous rows for surface or suspended mounting. Applications include light commercial, industrial, retail, coves and displays. Heavy-duty channel is die-formed from 22-gauge steel. Channel cover snaps to housing for easy access to wire way. Electrical connections are made inside the wire way. Standard mounting holes and wiring knockouts are included. Housing is finished in lighting grade white baked gloss enamel paint. No diffuser, fluorescent lamp is exposed. For use with 59 watt, 96" T8 slimline linear lamps. The fixture is cULus listed for damp locations. Fluorescent strip channel retrofit kit to upgrade an existing 8? strip fixture into a newer and more efficient electronic T8 strip. Uses two (2) 4? gear trays that install independently for easy installation. Lampholder cutouts guarantee correct spacing and that lampholder will not fall out during install. Code gauge steel. High gloss, baked enamel finish. NEC compliant luminaire power disconnect standard. Contents: 2 gear trays with fully wired high efficiency instant start T8 ballast and lampholders, 12 tek screws, 4 gear tray tethers. Electronic ballast, inherent thermal protection, class P. 8' length, 4.25" width, uses 4 lamps, not included. 120-277 input volts. UL Listed. White double striplite. Uses two 59 watt bulbs, not included. UL Listed. Fully assembled, dual 2ft LED grow light requires no lamps to replace. Rated for high humidity use. Instant full brightness. No humming. Includes 5 foot plug-in cord with on/off rocker switch and a 6 inch hanging wire harness. Linkable up to 8 fixtures. UL/CUL Listed FCC Compliant. 1.73"H x 23.3"L. 120 volt, 19 watts. Molded of durable white thermoset plastic. Can be used for flush or surface mounting. Push wire cap, screw switch. Maximum 660 watts, 600 volts. UL Listed. Replacement for an older T12 or T8 8 foot strip light. Kit contains 4-4 foot LED tubes, 8 non shunted sockets and 1 metal retrofit kit. Integral driver bypasses the ballast. 15 watts per LED tube - (60 watts total). 120-277 volt, 1800 lumens per LED tube - (7200 lumens total), 5000K. Instant start down to -4 degreesF. 50,000 hours rated life. DLC and cUL certified. Economical low profile with a narrow wrap. Clear prismatic diffuser. Diffuser hinges from either side for easy mounting. Stem, continuous or individual mounting. 48-1/4" x 13" x 3". Used where traditionally a fluorescent fixture would be used such as garages, sheds, out buildings, utility rooms, workshops and closets. 120-277 volt, 4000K bright white light. Instant start down to -4 degrees F. 50,000 rated life. Energy Star and cUL Certified. Endcaps are made of black, high heat polypropylene. UL Listed. Endcaps are made of black, high heat polypropylene. UL Listed. Bluetooth speaker enhanced LED shoplight comes with 2 speakers and chain packet to suspend. For workshops, hobby rooms, basements, sheds, garages or anywhere additional light is needed. Bluetooth speakers pair with IPhone and Android smart phones. Speakers have a 30 foot range. 35 watts, 120 volt, 3200 lumens, 4000K, 50,000 hours rated life. Instant start down to -4 degreesF. Energy Star and cUL certified. Endcaps are made of black, high heat polypropylene. UL Listed. Do-it-yourself, easy to install. Slips out for cleaning. Fits all suspended ceiling systems. 3/8" depth. Boxed. Virtually unbreakable, non-yellowing and easy to cut. Do-it-yourself, easy to install. Slips out for cleaning. Fits all suspended ceiling systems. 7.87 Sq. Ft., 23-3/4" x 47-3/4". Do-it-yourself, easy to install. Slips out for cleaning. Fits all suspended ceiling systems. 3/8" depth. Boxed. Virtually unbreakable, non-yellowing and easy to cut. Do-it-yourself, easy to install. Slips out for cleaning. Fits all suspended ceiling systems. 7.87 Sq. Ft., 23-3/4" x 47-3/4". Do-it-yourself, easy to install. Slips out for cleaning. Fits all suspended ceiling systems. 3/8" depth. Boxed. Do-it-yourself, easy to install. Slips out for cleaning. Fits all suspended ceiling systems. 3/8" depth. Boxed. Do-it-yourself, easy to install. Slips out for cleaning. Fits all suspended ceiling systems. 3/8" depth. Boxed.